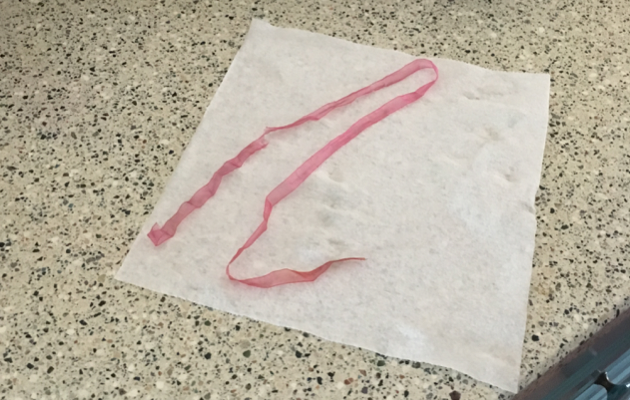 We have a piece of ribbon, a fourteen inch piece of ribbon to be exact, that came out of Magic’s (our black cat) intestine. Tearful memories of Moby, our great white cat with a UTI and kidney stones at the same age (2 years) to whom we’d administered IV’s at home and force fed amidst much growling and hissing, glistened on our eyelashes. “It’ll just be one thing after another,” Hubs predicted, “sometime in the future we’ll have to draw the line…why not do it now?” …and save a lot of money his brilliantly blue eyes beamed at me. He was right of course. In the end we’d had to put Moby down and the prospect of going through it all again sent a sharp pang through our hearts and wallets. I stood aside to let euthanasia crawl its way to the top of the list. 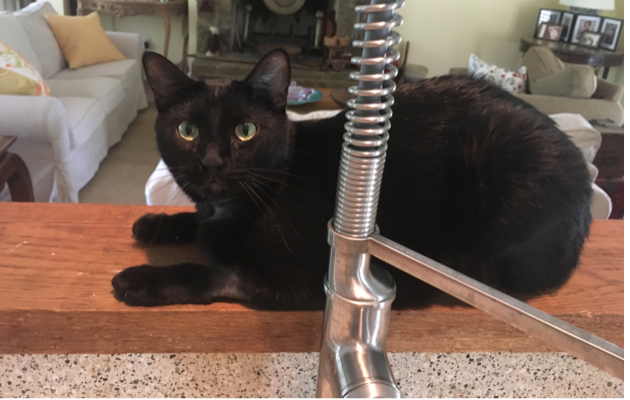 Hubs called the Richardson Animal Shelter where our son, Simon, is a legend, and arranged the grim deed and we watched our lovely cat retreat under the couch and sit, staring out at me with his piercing green eyes every time I crawled over to check on him. He tolerated strokes and coos, not like Moby who had turned uncharacteristically mean, and I pulled him out several times for a cuddle and a pep talk while massaging his soft tummy. At 630 on Sunday morning I got up and took one look at my prized cat beneath the sofa, staring out at me with his bright eyes, bemused and helpless, and knew I couldn’t take him to his death. He had to be re-hydrated (he’d spent the last two days vomiting and refusing food or water) and went under the knife at 230 in the afternoon. the warm snuggle of him pressed against my side at night. “It was a 14″ piece of ribbon,” the vet told me when he called, “I managed to get it out in one piece,” he said, “with no additional cuts,” he clarified. 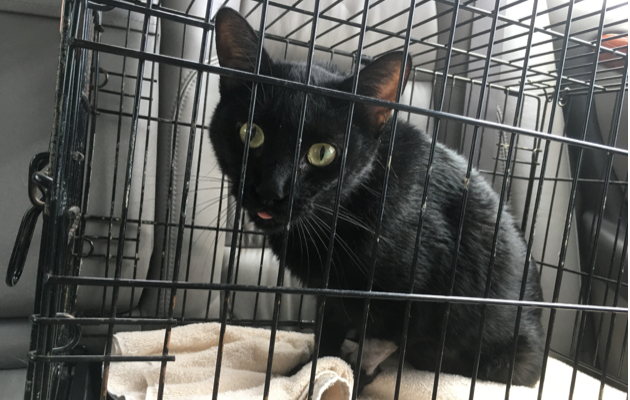 We took him to our vet on 380 in McKinney to be monitored until he was cleared to go home but his temperature was 104° on arrival, too high for a cat; too high for any mammal; too high to be handed off with a flippant comment about peeing. 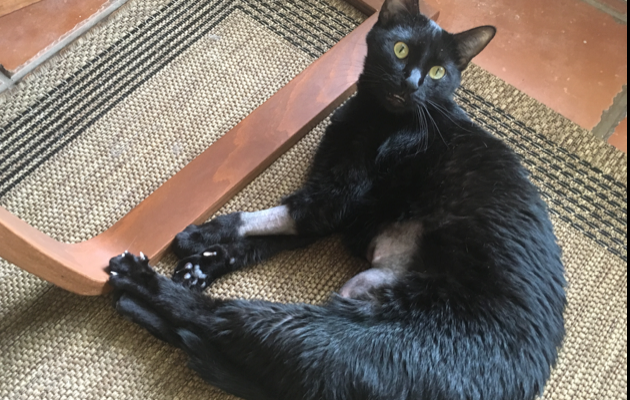 “I think he has an infection, we can’t get his temperature to come down, the only thing we can do is go back in and see what’s going on…” I listened in silence, “if we don’t he’ll die,” the vet told me. “I thought he was supposed to have had an anti-biotic shot that lasted 2 weeks,” I said. It turned out that none of his records or chart showed that he’d had the shot. “Let me call the emergency hospital before they close and talk to the techs…” I was stalling while culpability was testing the waters and my cat was dying. “All right,” he said hesitantly, “I’m going to be at the shelter all day doing surgeries…” he trailed off not wanting to rush me with a difficult decision. “We don’t want to open up any animal without running tests and diagnostics,” someone said before quoting an astronomical fee. It looked as though Hubs’ prediction about ending up like Moby was playing out. We called our vet’s office to tell the staff we’d be in around noon to bid Magic farewell. When we arrived the office staff told us that the vet was coming back later to perform an emergency operation on a dog and he could open up Magic and see what was going on if we wished? After stroking Magic and drowning in his trusting eyes I couldn’t find it within myself to send our bewildered, brave, sweet, cat to his death simply because he’d accidentally swallowed a piece of ribbon. 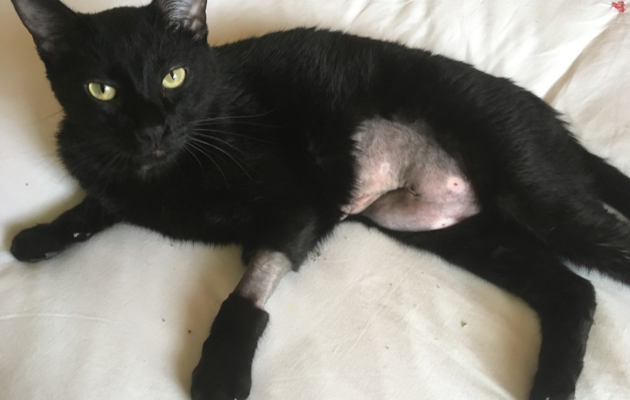 The cost for his second surgery would be a fraction of what we’d already paid and Hubs looked over at me and we mutely nodded our heads in assent. Our vet told us there was indeed an infection as he’d suspected…he’d cleaned him out and within hours Magic’s fever was coming down and he was eating. At our suggestion the two vets talked and agreed the infection was at the original incision site. The emergency room vet called us and took full responsibility and said he would cover all the costs incurred since leaving his care. Our vet stitched Magic up from the inside and super-glued his incision so he didn’t have the indignity of wearing a cone. Within 24 hours we were able to take him home. Two weeks later, after force feedings for seven or eight days, pain medication, antibiotics and lots of loving we think he’s going to make it, although he is still a little cautious about his sore tummy when jumping up or down from the bed. and they are wrestling, gently, again. hiding his bare belly while awaiting his new favorite water fountain to be turned on. Hubs and I are now paid up members of the More Than A Thousand Dollar Cat Club and it’s heartening to know that ethical behavior is alive and well in McKinney.